Welcome to the October edition of the Architects Certificate monthly newsletter. This month has seen many great additions and extensions to the many services that will be invaluable to our clients. Avid readers of this newsletter will have read about our up and coming Certificate Plus+ scheme, this scheme is now coming to fruition as Architects Certificate have teamed with a large warranty provider to provide an enhanced PCC (Professional Consultants Certificate) which will include a full 10 year defects warranty. Architects Certificate has also expanded its services by providing structural surveys, this will allow us to make greater use of the talent afforded to us by our RMSs, whose vast knowledge in the many areas of construction will no doubt be of great benefit to our clients. Readers of our last newsletter will know that we have been following the construction of four mews houses in the Norden area of Rochdale. This project has now reached a level of progress that calls for our second site visit, this is to inspect the construction at DPC level. This visit was carried out just over two weeks since the first inspection. 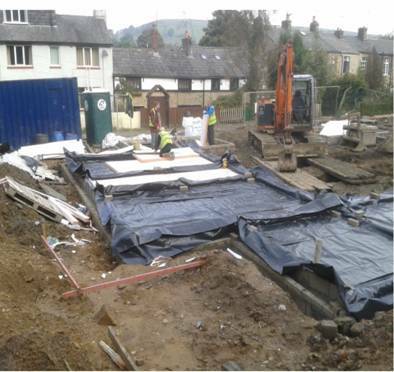 As you can see the project has come a long way since our last inspection, where the concrete had only just started to be poured into the excavations. Now the outer and inner walls have been constructed and the DPM (Damp Proof Membrane) has been laid with layers of ground floor insulation being placed on top of the DPM. The concrete can now be cast for the finished floor. Avid readers of the newsletter will remember we were following the progress of an eco-build in Penymynydd in North Wales, when we last visited the site the timber frame had just been constructed with the roof about to be put on. Since then the property has significantly progressed, the roof covering is nearly completed, and triple glazed windows have been installed on both properties. 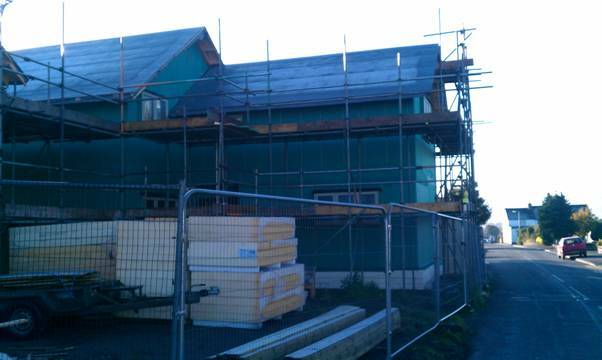 This will provide an airtight and well insulated property for the winter months.